"Billy Budd" by Herman Melville. Captain Vere as a "tragic hero" in the story. In the novella _Billy Budd_ by Herman Melville, Captain Vere is the "tragic hero". he is neither good nor evil, but rather a man whose concept of order, discipline, and legality forces him to obey the codes of an authority higher than himself even though he may be in personal disagreement. Captain Vere is sailor that is distinctive even in a time of renowned sailors. He has noble blood in him, but his advancement through the naval ranks to that of captain is due more to his outstanding service and personal merits than through any connections that he may have had. He was made a post-captain because of his "gallantry in the West Indian waters as flag-lieutenant under Rodney in that admiral's crowning victory over De Grasse". Captain Vere is a rather surprising man to be a captain, for when he is dressed as a civilian he would never be taken for a sailor. For example, he never used nautical terms in his everyday conversations. Even aboard ship, if one did not know that he was the captain, he could easily be taken for some royal of the king's that is being transported from one place to another. 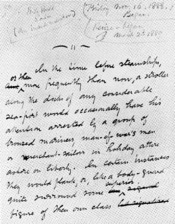 As Melville points out, "He had seen much service, been in various engagements, always acquitting himself as an office mindful of the welfare of his men, but never tolerating an infraction of discipline; thoroughly versed in the science of his profession, and intrepid to the verge of temerity, though never injudiciously so." In fact, his downfall is directly caused by his never tolerating an infraction of discipline. WriteWork contributors. ""Billy Budd" by Herman Melville. Captain Vere as a "tragic hero" in the story." WriteWork.com. WriteWork.com, 01 March, 1997. Web. 25 Apr. 2019. Billy Budd, by Herman Melville. Was Captain Vere Right?